There is a small, old workshop in an old neighbourhood in Azraq. Inside, a man with a smile that warms your soul, welcomes you with fresh Arabic coffee and invites you in to explore art, culture and history through his timeless creations. 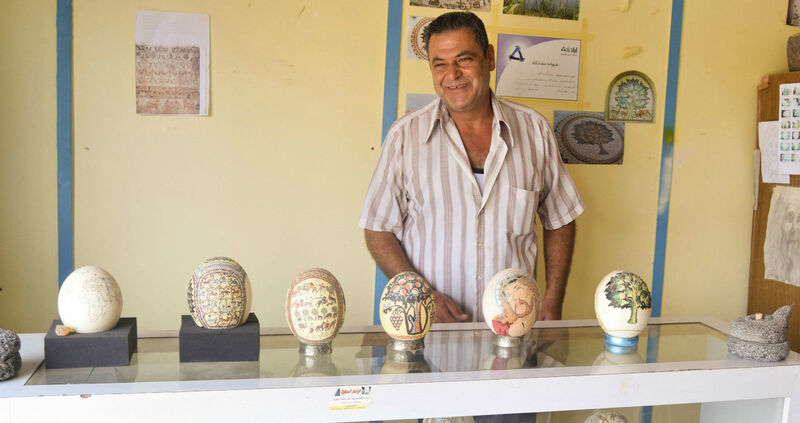 Nedal Hmoud is known across Jordan as the man who creates the most beautiful, intricate drawings on ostritch eggs. But that is only a small part of his story. Read on to find out more about his background and how the USAID Jordan Local Enterprise Support Project is supporting him to grow his business and create new revenue streams. Nedal Hmoud has been passionate about art all his life, but making a living as an artist is tough in a place like Azraq, a small desert town in central-eastern Jordan. Therefore, he had to set his art aside and opened a small bookshop that catered to the people living in the area. Nedal’s family owned one of the 16 ostrich farms that were in Jordan many years ago, and he always knew that he can do much more with the ostriches than just take care of them in the farm. “Azraq was one of the few towns in the kingdom that had ostriches back then, and I knew there were some unexplored business opportunities there” he said. In 2005, he decided to sell his bookshop and dedicate himself entirely to raising ostriches. Along with his brother, he made a significant financial investment and bought five ostriches for over 5,000 JOD (around $7,000), purchased an egg hatching machine to grow the number of his flock, and opened an ostrich butcher’s shop. However, business was slow, and they were struggling. So he had to think of something else, and eventually found a way to use all the egg shells instead of discarding them. 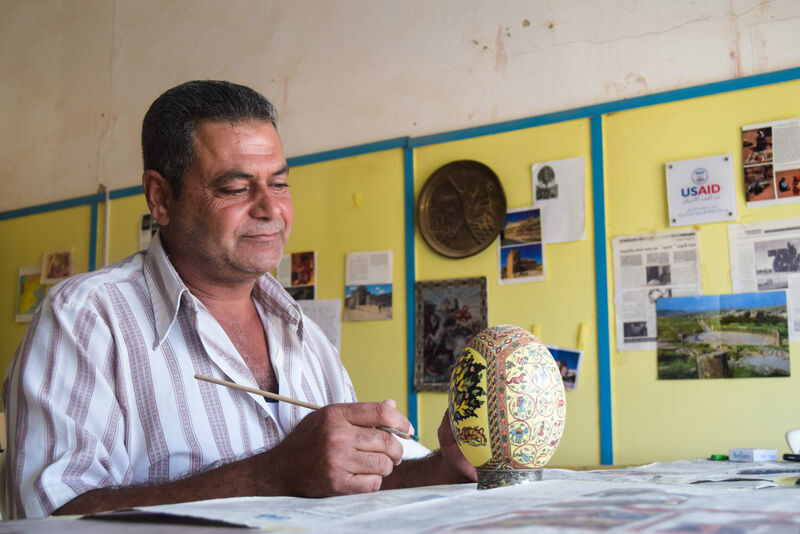 To Nedal, every egg shell was a new canvas waiting to be filled with art that represents his own identity and reflects his local culture, so he started painting them. He created his first masterpiece and displayed it in a local souvenir shop often visited by tourists. Three days later, the egg was sold for 300 JOD (a little over $400). Demand for these beautifully-decorated eggs picked up quickly but the supply was limited since it was just him and his brother working solely on the business. So Nedal decided to start training women on how to carve his paintings onto the egg shells. His business model was simple yet incredibly efficient; women receive training on how to paint ostrich eggs for 1-3 months at his workshop, and once they have the sufficient skills and training, can then work from their homes. That way, Nedal receives the support he needs and in a conservative region without many job opportunities, this also gave local women the opportunity to earn more income for their families without having to leave their homes. So far, Nedal has trained and worked with over 35 women from the local community in Azraq with the help of a local NGO which links him with the women. Small businesses like Nedal’s are vital to the growth, heritage and survival of remote and local communities. To strengthen these businesses’ ability to withstand economic adversity, the USAID Jordan Local Enterprise Support Project (LENS) developed a strategy to help them diversify their revenue streams so that they are not entirely dependent on one business model. One way to do this is through supporting micro and small businesses in local communities to develop experiential tourism activities. Experiential tourism is a form of tourism in which people focus on experiencing a country, city or particular place by connecting to its history, people and culture through particular activities such as cooking, hiking and painting with local hosts and other similar experiences. USAID LENS’s support in the tourism sector is mainly focused on local communities, where it identifies hosts with skills and fields of work that are authentic and genuine to Jordanian culture. Together with Nedal, USAID LENS developed a full experience for visitors in Nedal’s very own workshop in Azraq, where he gets to teach his passion to visitors from all around the world. The experience starts with an introduction about the area’s history and culture by Nedal himself; an Azraq native and a charming storyteller. 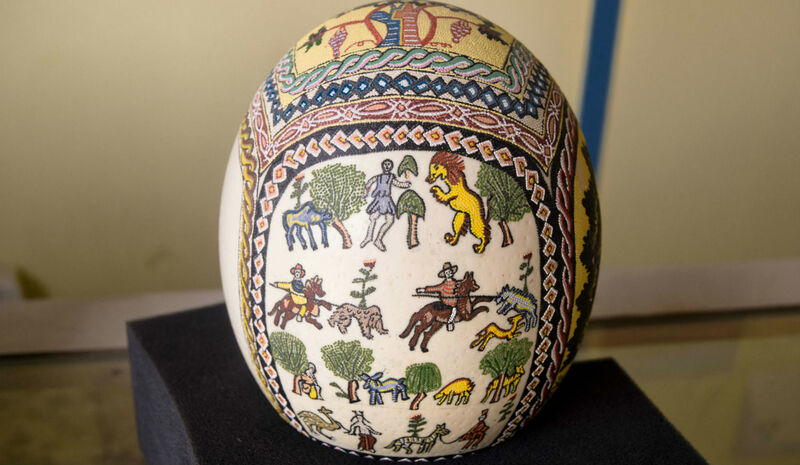 After that, visitors get the opportunity to learn how to paint drawings from Jordan’s local culture and heritage on ostrich eggs, and finally, they have a delicious Jordanian meal prepared by Nedal’s wife, at his home. For many small business owners in local communities around Jordan, providing experiential tours is not something they had ever anticipated doing. But with close support from USAID LENS, they are quickly realizing the potential to not only increase their revenues from providing such a service, but to also share their culture and their skills with people from all over the world. However, given their limited resources, micro and small businesses (MSEs) in Jordan do not have the budget or the reach to market their experiential tours, especially to reach their target tourism audience in international markets. For this reason, USAID LENS has partnered with Jordanian inbound tour operators to link them with MSEs like Nedal that provide experiential tours. This way the tour operators can offer new, more locally-focused “off-the-beaten-track” tours to their customers, and the MSEs will benefit from being included in a larger tour company’s regular itinerary that can bring them a steady flow of customers. USAID LENS has identified over 120 MSEs that have the potential and capacity to be integrated into the experiential tourism sector in Jordan, and is currently supporting 40 of them to develop tourism experiences to broaden their business offerings and generate new revenue streams. Learn more about what USAID LENS is doing to support experiential tourism here.